Home / Blog / How prejudiced is Britain? Research published by the EHRC shows that 42% of people in Great Britain have experienced some kind of prejudice in the last 12 months. 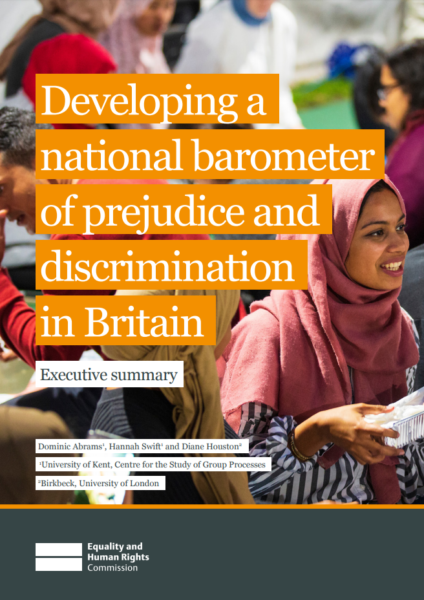 Almost 3,000 people across England, Wales and Scotland were surveyed about their experiences of prejudice and their attitudes towards different groups. This insight has proven to be extremely interesting as we are used to data on hate crimes and discrimination, but this has provided new data on what attitudes are held by people about others. Indeed, there are worrying figures that show significant proportions of Welsh respondents have negative feelings towards transgender people (19%), Muslims (22%) and Gypsies, Roma and Travellers (42%). Of course it is possible that other respondents may not have been comfortable openly expressing negativity towards these groups and others, and in reality the figures may be higher. It is also important to note that around a third of those surveyed thought that attempts to provide equal opportunities had ‘gone too far’. Given that equality can only be achieved, not surpassed, people who think equality has gone too far are indirectly expressing prejudice or resentment towards that group. Despite advances in mental health awareness in recent years, a quarter expressed discomfort with having someone with a mental health condition as their boss (29%) or as a family member (25%). 61% of people with mental health conditions have reported discrimination against them. The report contains much more data, with many broken down to a Wales level. This is an important read for those not only in equality and diversity specific roles, but also to those working with tenants and communities. Understanding the underlying roots of discrimination and prejudiced behaviour is vital. Time to Make the Shift?